they were easy to carve. The seeds came out easily, and I had those puppies whipped into shape in less than 90 minutes, thanks to my favorite tools (a curry spoon and a keyhole saw). I had to do them on Sunday afternoon, because I was afraid they wouldn’t last a full week – also, with the size of the biggest one, there was no way I could give it a bleach bath, and I didn’t want to go through the mess and hassle of fixing up a spray bottle of bleach and water. For two glorious nights, they glowed! If anything, the candles were the problem; old ones that kept burning out. However, that was easily fixed. 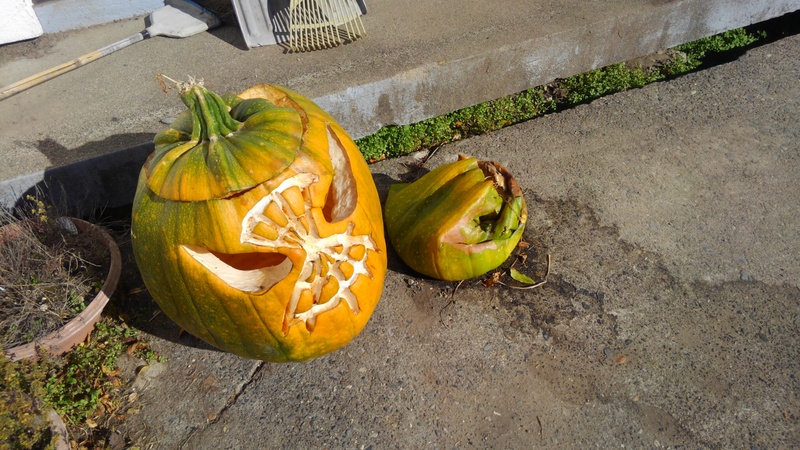 But on October 30th, the little pumpkin began its slow decline into oblivion. It slumped. I do like the way pumpkins get scarier and scarier the closer you get to Halloween. Their faces warp, and sometimes you get creepy mold-inspired colors that make them a real fright. But this wasn’t normal aging – this was a stroke. The entire right side of the face collapsed. So, for the big night, I had one pumpkin glowing in the dark. It was enough. The brave little trooper lasted all the way to Saturday morning when I could finally cart it to the garden, and even now, it’s probably grinning over the frost-bitten ruin of the compost heap. The little guy put up no fight as I scooped him up with a shovel and deposited him in his final resting place. No scary burst of insects flying out, no last wheeze of rotten pumpkin. Just that poor posture, as by that time, his face had completely caved in. So, what is the moral of the fable? I can think of several; you can think of some too, and then we’ll let people choose their own adventure. Fruit plucked too soon never ripens. Ideas can be the same way. If we try to work with something that isn’t ready, it tends to collapse into itself, and never matures properly. But on the other hand, good enough is good enough. My family enjoyed the pumpkins for several nights, and their cheerful glow was a nice change of pace in the dark night. Should I have left them in the garden, waiting for a perfection that was to never come? No. In the same way, it’s kind of silly to let an idea rot because the situation is not perfect. Why not shape it, and do your best, and have fun with what you’ve made? And also, this isn’t the last time I’ll make jack-o’-lanterns. Maybe next year, I’ll get them into the ground early. Or I’ll be driving in the country and run across a farmer with about a hundred orange beauties to sell. Live and learn! I think this is a great lesson during NaNoWriMo season, as well. November comes every year. Do what you can with it; remember past successes and know that it’s still good if you are having fun. And, there’s always next year! This entry was posted in Creativity and tagged better luck next year, E.M. Duskova, Eileen Duskova, good enough art, good enough writing, It's a process!, Michaeline Duskova, NaNoWriMo 2018, National Novel Writing Month, persistence, writing ideas. Bookmark the permalink. Glad you enjoyed your Halloween, Michaeline. It sounds like it was fun at your house. (-: I was going to expand on that — something about how good tools (or at least the right ones for the artist) can turn a sow’s ear into something really decent. But I couldn’t quite figure out how to make it flow. I couldn’t bring myself to delete that part. I’m glad I didn’t now! 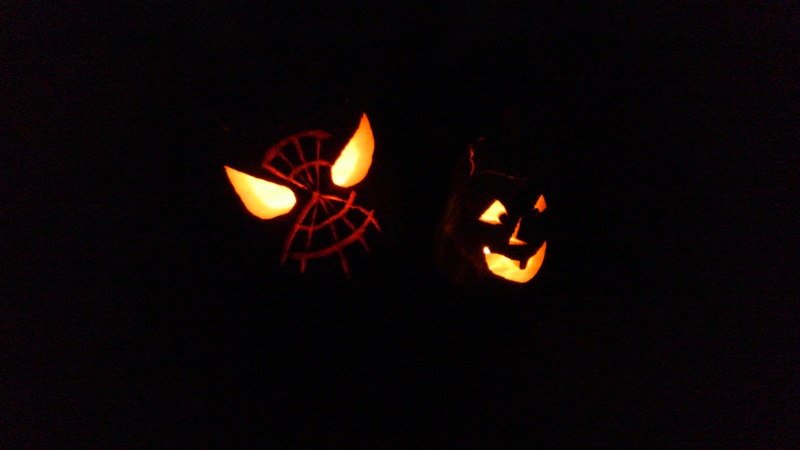 The pumpkins were the alpha and omega of Halloween at our house this year. No kids, visiting or otherwise. But my in-laws and husband come back from the barn after dark (ie: after 4:30 p.m. these days), so I wanted to have something cheerful for them. In writing news, I haven’t put a word to paper yet on my NaNo, but I’ve discovered a lot of great stuff — a heroine yesterday, a power source for building my world this morning. A little late, but in writing, there is no frost! Nothing is going to turn into pumpkins at midnight on November 30th, unless I choose to let them do so. I’m going to have a story by the end of the year (-:. Or at least, a first draft. 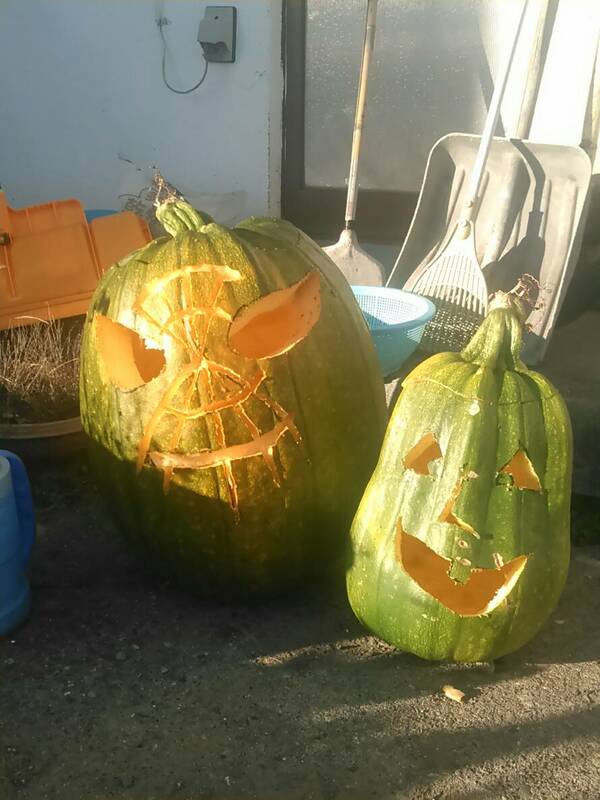 I love your green jack-o-lanterns. They remind me of the year we decided to use watermelons instead of pumpkins. (-: I think watermelon-jacks are the coolest thing! All red inside! Did you eat most of the innards, then? Watermelons are really expensive here, and it’s not the season, so they’d be extra pricey. But they do make great jack-o’-lanterns! With our big-box stores here, nothing ever seems to go out of season, it just comes from different places. And yes, we ate what we scooped out.